If you are short of time, the answers to the following 3 questions should let you know all you need to about the HealthyWhite+ HX8911/04 (view on Amazon). If we have missed something, let us know in the comments. 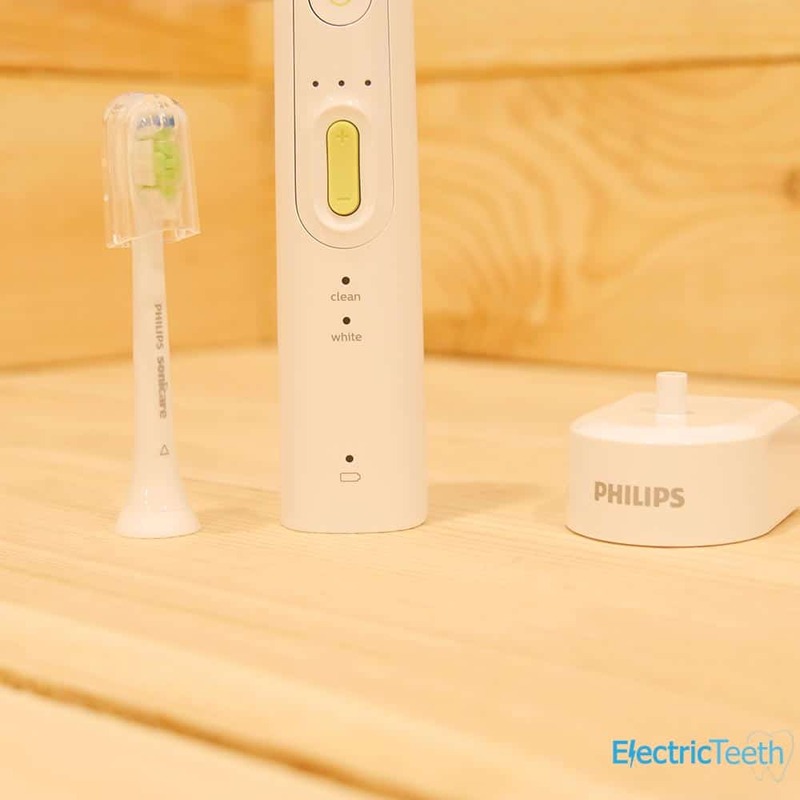 If you want more detail, you can read the full Philips Sonicare HealthyWhite+ HX8911/04 review further down the page or watch our video review. Sonicare brushes are constructed to the highest standard, offer superb battery life, clean well and are nice and quiet. The brush does the job well, it is just feels a little expensive given the limited box contents and cleaning modes. We have given a rating of 3/5 to the HealthyWhite+. Far from a bad brush, there are what we thing are better options to chose from. The Sonicare ProtectiveClean 4300 would be our choice. A little sleeker, with built in pressure sensor and brush head replacement reminder system, it can help you improve your oral heath a bit easier. Or for those on a little more of a budget, the EasyClean HX6511/50 offers what most people need from a toothbrush. 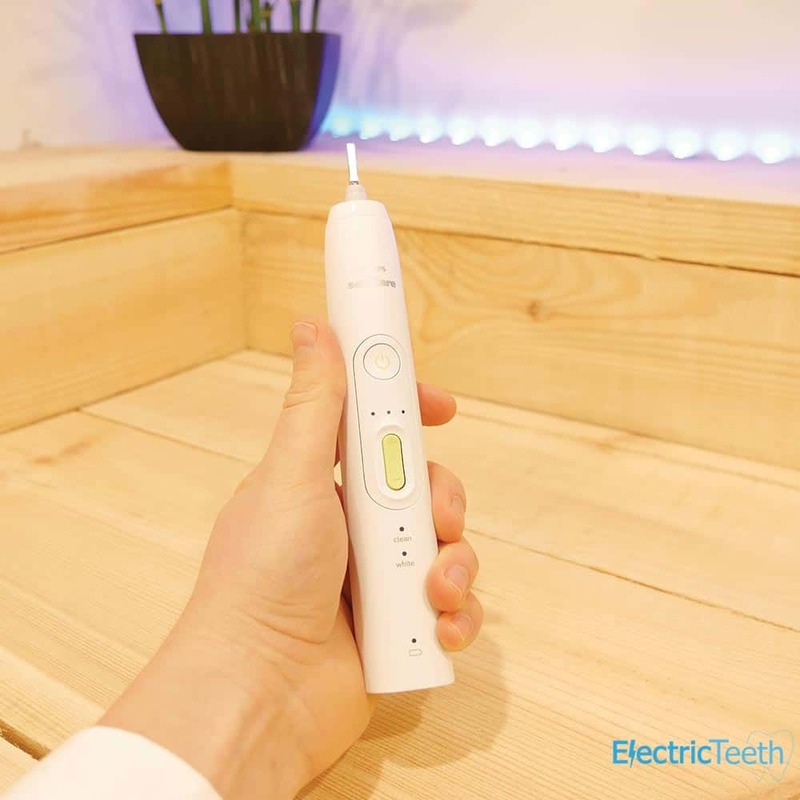 If you have stumbled across the HealthyWhite+ HX8911 and a really not sure what you need, we have put together a series of lists in our best electric toothbrush article that look at budgets and user needs which could help you in making a decision. 3. Where’s the best place to buy HX8911/04 Sonicare HealthyWhite+? This brush is available in a variety of locations and outlets — we have listed several options below. Most retailers at the time of writing were selling the brush for £75 with a couple, including Philips being much closer to the recommended retail price. Typically we recommend Amazon because it is very competitive on price with quick delivery, but we’ve listed several online retailers in our price comparison table below. It’s always worth checking eBay as well. Most certainly a mid-range electric toothbrush the HealthyWhite+ does serve a purpose, but is stuck between the cheaper basic toothbrush and the more feature rich premium brushes. Therefore financially it can leave buyers in a quandary as to what to buy, particularly given some alternative brands are offering equivalent brushes at quite a bit less! Sonicare quality could prevail, but it is worth exploring the cheaper alternatives as well. There are potentially several different variations of this brush. Some retailers may or may not clearly label the different models, so it is worth being vigilant and understanding the differences. 2 cleaning modes – It might be normal for most of us to stick to the standard ‘Clean’ mode, but the ‘White’ mode is appealing for those looking to achieve that polished, dentist clean look and feel to their teeth. Timer and automatic power off – Timing your clean not only helps you clean for the right amount of time, focusing the right amount of attention to the different parts of the mouth, this is further enhanced by a very simple, yet effective means of conserving battery power and signalling the end of the clean. 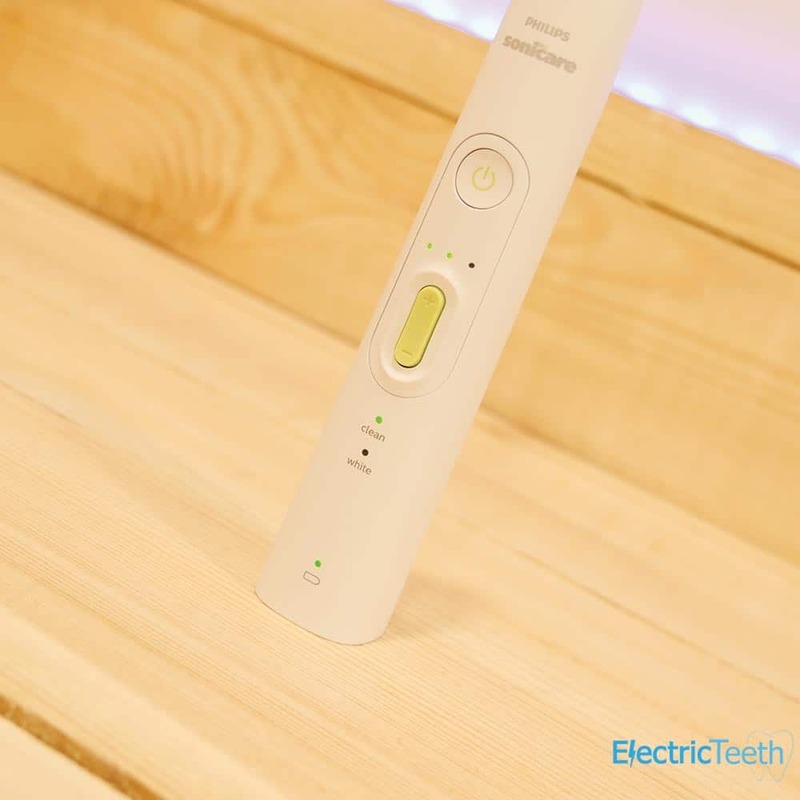 Easy-Start – Get eased into the power offered by an electric toothbrush with a programme that intensifies the power used over 14 brushing sessions. Intensity Levels – Change between 3 different power settings to find the one that is most comfortable for you as you brush your teeth and gums. Box contents – Functional and basic, it would be nice to get a little extra value included such as a travel case. Price – The brush is relatively expensive for what you get given the alternatives available. Satisfyingly chunky are the words that first come to my head when holding this brush. It is far from the slimmest, but is by no means too large a brush; it feels solid in hand and well constructed. The primarily all-white body has the odd mint-green-coloured accent to it, namely the power button icon, the intensity button and the base of the brush. The brush is not quite perfectly round, there is a slight squaring to the brush handle that gives a bit of strength and grip to the handle. Although only visible properly under certain lights, the rear of the handle does have a series of very lightly textured strips built into the body. Barely noticeable, yet the most subtle change in texture as you run a finger over them — just enough to offer a little extra grip, but not affecting the aesthetics of the brush. The Sonicare logo sits proudly in place, finished in a deep grey at the top of the brush handle just below the neck of the handle where the brush head attaches. Below this, inset in a gloss white plastic frame, is the recessed power button, 3 LEDs and what looks like a volume control in green. This control is to increase or decrease the intensity level of the brush and in turn changes how many of the LED’s above it are illuminated. Towards the base of the brush, outside of the gloss white frame is a clean and white cleaning mode name, with a single LED above each with a battery status icon right towards the bottom of the handle. The base of the brush is the same green as the other accents on the brush and has a recess into which the pin on the top of the provided charging stand fits into. Both the on/off and power intensity keys provide a reassuring level of feedback and do require a small amount of force to be activated, but are not so soft that they could be pressed too easily. Overall the brush looks smart — a little clinical — but not out of place in most homes. Would other colour options be nice? For sure. Required? No. There is a reassuring quality to the brush with the only apparent weakness looking to be the plate on the bottom of the brush, which if removed, would reveal the internals of the brush handle. There is no reason to question the fit and sealing of this joint, but if I had to pick a weak spot, that would be it. As you will have seen from the listing of the box contents, there is not much to cover: 1 x brush handle, 1 x DiamondClean brush head, 1 x travel cap and 1 x charging stand. Not exceptional but all you need to be up and running. A single press on the power button will activate the brush and it will begin on the last cleaning mode it was set to. Another press on the power button will change the cleaning mode. Press it a third time to turn the brush off. Clean is the ‘go-to-mode’, if you like, for most people. Lasting 2 minutes it does all you need to remove plaque, bacteria and debris, leaving you with a clean and fresh mouth. White mode lasts for 2 minutes and 30 seconds and is designed to give that dentist like clean with a focus on polishing up the teeth so they look nice and white. 2 minutes for standard cleaning and then the remaining 30 seconds focused particularly on polishing the front teeth. Considerably more noticeable is the resulting sound and brush stroke pattern in this last 30 seconds. With either mode the built in pacer and timer activates giving a slight pause in the brush head motion at 30 second intervals which changes the sound emitted from the brush, signaling to you to change quadrant of the mouth when cleaning. When the 2 minutes or 2 minutes and 30 seconds in the case of the White mode is complete, the brush automatically powers off, signalling the end of the clean. If you want to continue, just press the power button again. This brush offers up to 3 weeks battery life from the built-in battery, but more on that later. It does a great job of cleaning and at no point did I feel the brush had done a poor job, my teeth felt clean and refreshed after each clean. 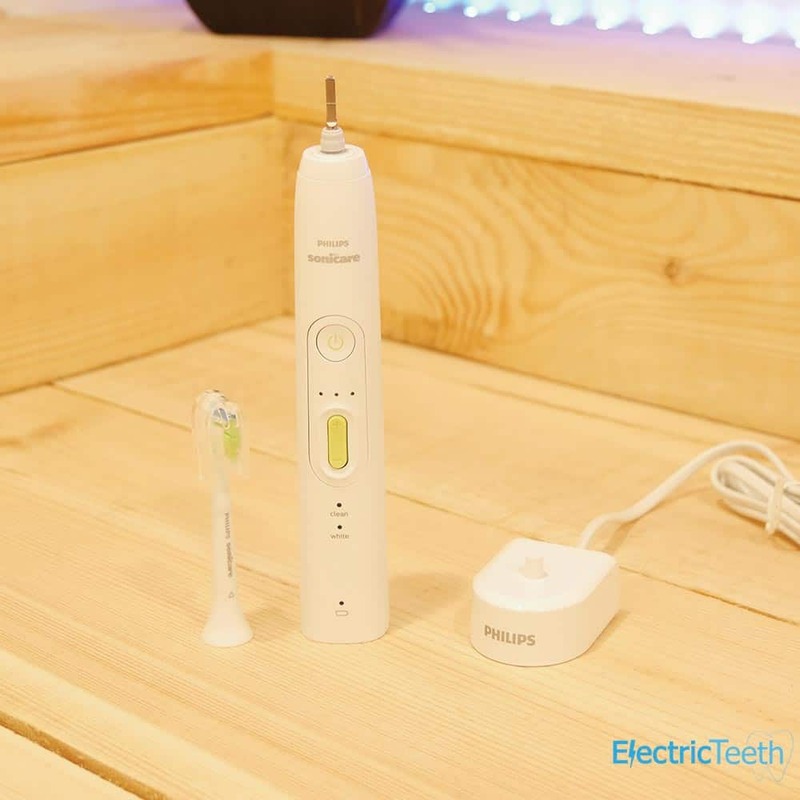 Compared to a manual brush the HealthyWhite+ with the provided DiamondClean head could remove up to 7 times more plaque, leaves you with healthier gums in just two weeks and whiter in just 1 week according to Philips. I cannot confirm or deny these figures but I am convinced that within just a few weeks use you will feel an improvement yourself, if coming from a manual brush. The three levels of brushing intensity really makes a difference. You can get the power output between low (1 LED indicator light), medium (2 LED indicator lights) and high (3 LED indicator lights). There is a noticeable difference in the power delivery to the brush head and also the sound emitted from the brush with high being the most powerful and loudest. Even on the most intense setting the rush is still quieter than an Oral-B equivalent. Finding the right intensity for you is important. The more powerful the potential for more plaque removal, but if you find this uncomfortable do not continue and reduce the power. You can change this intensity mid clean by simply pressing the + or – button in the centre of the brush handle. Supplied with a DiamondClean brush head this works in conjunction with the White mode particularly to leave you with clean and healthy teeth but also whiter ones, removing surface stains from the teeth. In the words of Philips this head provides superior cleaning, improved gum health and whiter teeth in just one week. The DiamondClean head is one of a range of different heads that are available and all are interchangeable. So for example if you do not get on with this brush head or find it too big you can opt for one of the others explained below. Any of these can be purchased separately. The pack size and the head size does differ depending on the one you opt for. There is the standard size and the compact option for the harder to reach areas of the mouth. We have written about them in detail in our guide to Sonicare heads. The reminder bristles are the blue coloured bristles which over a typical 3 month period will fade from a relatively strong blue to white colour. If they turn white, replace the head. A great feature for electric toothbrush newbies is the the ‘Easy-Start’ option. Designed specifically for first time users, to help ease into using such a powerful electric toothbrush. The Easy-start feature gradually increases the sonic power over the first 14 brushing sessions. Another small but nice feature is the charger confirmation. Deactivated as standard, you can set it so that when the brush is placed on the charging stand is beeps and vibrates to give that confirmation that it has been seated. Great for the visually impaired. To activate the charger confirmation, press and hold the intensity level utton up (+) for 2 seconds. You will hear 2 beeps and the battery level indicator lights up green twice to indicate that the features has been activated. The brush needs charging not all that frequently thanks to the fixed internal battery that lasts up to 3 weeks. You can check the charge level in the brush handle via the LED icon towards the bottom of the brush handle that will illuminate a solid green when the brush is fully charged, flash green with moderate charge and flash yellow when it is low and could do with a top up. The brush itself is water resistant, but not water proof. This means if you rinse it under the tap and it gets wet, don’t worry too much. However, the brush is not designed to be used in or under water, so avoid using in the shower or bath. A rinse and a damp cloth is fine for cleaning. A pressure sensor is not really found on Sonicare brushes, but is on Oral-B. As the name implies if too much pressure is applied during cleaning a light is illuminated to alert you and you can reduce this so as not to do damage to the teeth. You soon learn, and it becomes somewhat redundant. It is not an essential but would be a nice inclusion that would help new users of an electric toothbrush. This said, brush too hard with the brush and you notice a change in motor sound which should act as a sign to reduce the pressure. The bristles of the brush need to skim the tooth surface. Bluetooth is another feature that is beginning to creep in at this price point and whilst it is far from required, it is another feature that makes the likes of Oral-B brushes potentially more compelling. Check out the Oral-B Smart 5 5000 as an example of a similarly priced brush with Bluetooth integration. Whilst a small travel cap is included with the brush, this fits just over the brush head. A proper travel case would have been nice, even if it wasn’t a fancy one that allowed the brush to charge in the case. Not essential, it just gives peace of mind when travelling that no damage will come to the brush and the brush head and protects against accidental activation. But overall as a brush it does do the job really well and some of these complaints are really minor all things considered. For peace of mind, the brush comes with a 2 year warranty that covers mechanical faults like the battery no longer charging or the power button not working. It does not cover user damage. Sonicare really does set the benchmark when it comes to electric toothbrush battery life. Colgate do match their standard, but the very popular Oral-B range continually falls short. At up to 3 weeks life from the lithium-ion battery that is built into this brush handle you can’t deny how ideal this is. It saves charging at home, but if you are travelling you can go away knowing you do not need to lug a charger with you. On the standard clean mode we achieved some 84 minutes of usage, that is 42 cleaning sessions, or convert that into days and that is 21 days battery life. This testing is based on the clean mode on the lowest intensity setting. Using the white mode and different intensity settings will affect battery performance a little. The handle (which contains the battery) is satisfyingly chunky, but not too chunky to feel uncomfortable in the hand or cumbersome to use. Somehow competitors Colgate manage to offer slimmer profiled brushes with equivalent power delivery. The automatic power-off feature found on this and many other brushes is very useful to you and I as users in not only notifying us of the end of the cleaning cycle but in conserving power also. Just 5-10 seconds after every clean over the course of a couple of weeks reduces the usable time available from the battery. It is also the smallest of inconveniences saved. How lazy is it, not to switch off your own toothbrush?! Supplied in the box is a charging stand. White in colour to match the brush it works on 110-240v which is great as it allows and is suitable for international travel, no voltage converters necessary. The 2 pin charger connects in the UK to the shaver socket found in most bathrooms. To connect to the 3 PIN mains sockets in the UK and other sockets around the world you do require an adapter. I tend to leave it on charge overnight. It is also perfectly safe to leave the brush on charge during the day to or simply when the brush is not in use. However, if you opt to do this, for optimum battery performance, every 6 months or so, do try and run the battery down a bit. A battery status icon on the handle indicates the condition of the battery. A flashing yellow indicators means low charger, with a flashing green indicating moderate charge. A solid green indicator and the brush has a full charge. A small but potential bonus feature is the charger confirmation feature. Essentially what happens is when the handle is placed on the charging stand there are beeps and a vibration from the handle. This feature comes deactivated out of the box but can be turned on. When turned on, it gives the confirmation of being docked on the charger via the sound and vibration. This is useful if as a user you have limited sight or hearing. 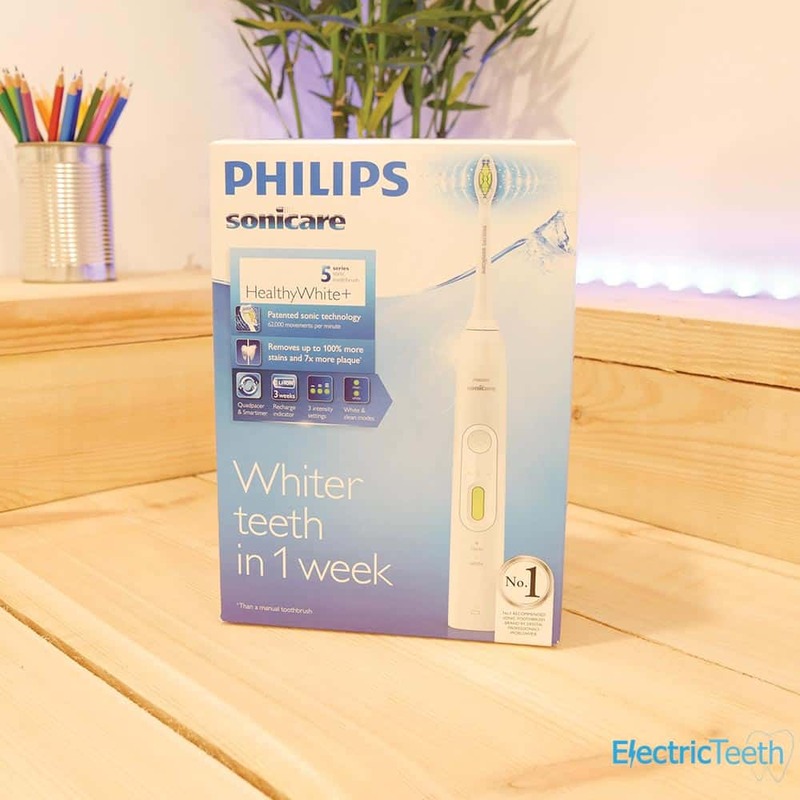 The Philips Sonicare HealthyWhite+ HX8911/04 has a suggested retail price of £150*. If you are reading this review before making any purchasing decision, do not pay anywhere near this! Check our list of UK retailers here to see who is cheapest. At the time or writing one major retailer is selling just below this price, while Philips itself is selling at the full price. Getting the HX8911 at half this price is possible and even then there is room for a little extra movement. My research shows that it has been sold as low as £45 but typically sells around the £60-70 price point*. The £70 we paid at the time of review is a sizeable amount of money when you actually consider what you are getting, especially when similar models from other brands are up to half the price at £30-35. There is no denying that some value comes in the quality of this brush, the battery life and the peace of mind that is purchasing a recognised brand like Philips, but with an equivalent at half the price, when does the question of whether it is worth it come in?! 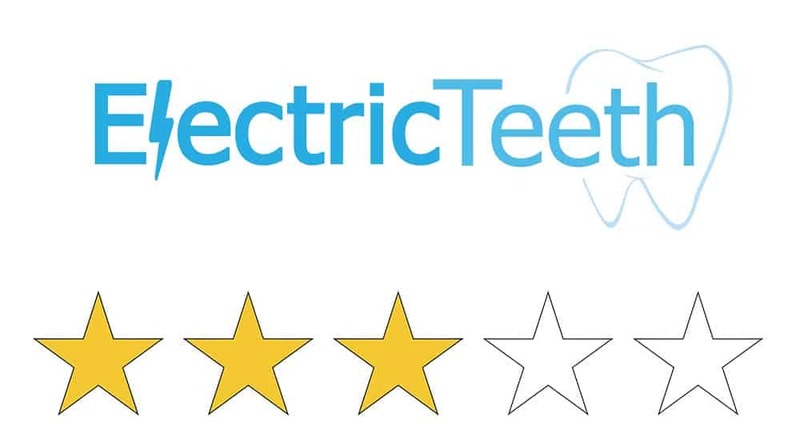 Whilst the brush is supported by a 2 year guarantee, here at Electric Teeth we work out the cost over a 3 year period as we believe from our research that this is roughly speaking the average time people will keep a brush for. Keep it for longer and you get only better value. You don’t need me to tell you that every 3 months you need to replace the brush heads, so over 3 years we need to factor in the cost 12 brush heads. 1 comes supplied in the box and the DiamondClean head is sold in packs of 4. At £25 or thereabouts for a pack of 4, each brush head costs £6.25 each. The cost of purchase of this brush becomes £138.75 (£70 + (11 x £6.25)). Over 3 years this works out at a daily cost of 13p. Manage to pick it up at a bargain price of £45 and the price drops to 10p per day. You do have to consider that the most cost effective brushes work out at some 6-7p per day but do not offer the premium features. You can also extend the value by sharing the brush handle with another user in your household. When you are looking to spend your hard earned money on something you invariably want to get value from that item. A toothbrush is not particularly exciting but it is one of those products that you want to ‘just work’. When reviewing any products here at Electric Teeth we try to test them properly. We do not have fancy stress testing equipment, but we give them a good look over, really analysing for weak points and potential failures, taking into consideration what we have seen on other brushes. The few weeks over which we review the brush is not really long enough to say how well it will stand the test of time, but all Sonicare brushes go through a strict quality control programme. While we are unable to do long term tests on all the brushes, we do update our reviews should we become aware of any issues that may be affecting different models. Generally speaking, with Philips the quality is top notch with few failure points. Yes the battery and internal electronics could go wrong; a button could come loose; but it is rare to see this. To prolong the life of any brush giving it a rinse and a wipe down to remove any grime that builds up is a must. The weakest point is the battery. After repeated charges and discharges it can fail and should it, they are not easy to replace. Remember, register your brush online to ensure you are covered in the event of needing to claim under this. Judging this brush on its cleaning modes and how it cleans the teeth I can find little to fault. It does the job well, leaving the mouth feeling fresh and clean afterwards. Little features like the easy-start programme, the different power intensity settings and the long battery life, not to mention the low level of noise produced by this brush all work in its favour. What really lets this brush down is when you take into account price and box contents against the competition. At circa £50 the price would be less of a sore subject but the value achieved from this brush is harder to justify. This then is where some of the alternatives come in. Our choice is the ProtectiveClean 4300, followed by the EasyClean, subject to your price point and needs. Don’t let me stop you buying the HealthyWhite, just be aware that there are equally great options that can leave you with a bit more cash in the pocket, or even more premium models that will not cost much more given the possible benefits. Is the Sonicare HealthyWhite+ an oscillating brush? This brush offers 2 different cleaning modes, Clean and White. Press the power button to switch the brush on, then again to be taken to the next cleaning mode. available. The HealthyWhite comes provided with one DiamondClean brush head. Sonicare do have a range of alternative brush heads that are compatible including, DiamondClean, ProResults, ProResults Gum Health, Sensitive and InterCare. Does the Sonicare HealthyWhite+ have a pressure sensor? Does the Sonicare HealthyWhite+ have Bluetooth? Does the Sonicare HealthyWhite+ have sound connectivity? Does the Sonicare HealthyWhite+ come with a warranty & how long is it? Does the Sonicare HealthyWhite+ have a built in timer? Can I use the Sonicare HealthyWhite+in the shower? We would advise avoid it. The brush is water resistant and designed to withstand exposure to water but the prolonged exposure to water in a shower is not ideal for the brush. 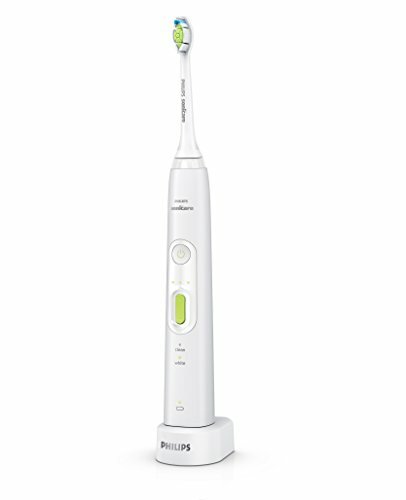 Do you own or have you used the Philips Sonicare HealthyWhite+ HX8911/04?